Many: fresh styling inside and out; new engines, including its first-ever diesel; new safety features; and expanded availability of the segment-exclusive 10-speed automatic transmission. These changes mark the midcycle refresh for Ford’s stalwart full-size pickup truck. This report focuses on the half-ton F-150 line. Full-size pickups remain the most popular vehicles sold in North America. Low gas prices and post-recession demand by tradespeople and like have helped sales. At the same time, buyers are again seeking large trucks as daily transportation and demanding convenience and luxury features once found on high-end passenger cars. Even taking often generous incentives into account, big-pickup transaction prices average around $40,000, about $10,000 more than the passenger-car average. Led by the F-150, Ford’s F-Series trucks are America’s best-selling vehicle of any type. Sales top the combined total of the arch-rival Chevrolet Silverado and the mechanically similar GMC Sierra, with Fiat-Chrysler’s Ram pickups in third place. No other full-size pickup is apt to catch it, but Ford can’t dismiss the competition, including the coming redesigned 2019 Ram 1500. 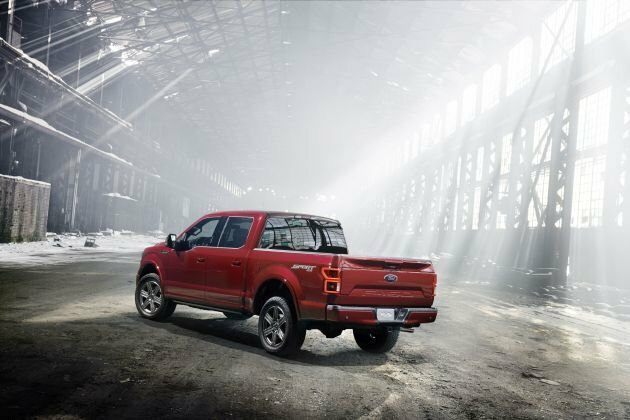 Because you want the absolute latest in F-150 styling and, if you’re a diesel-engine fan, because Ford is finally offering one in its half-ton pickup. Unchanged will be F-150’s steel chassis with aluminum body panels, the latter a first for a big pickup. They’re designed to be as strong as steel but much lighter, to the benefit of performance and fuel economy. The Ford faithful evidently accept them, but rival GM claims the aluminum panels — in particular, those making up the cargo bed — are easier to damage than steel and are more difficult and costlier to repair. 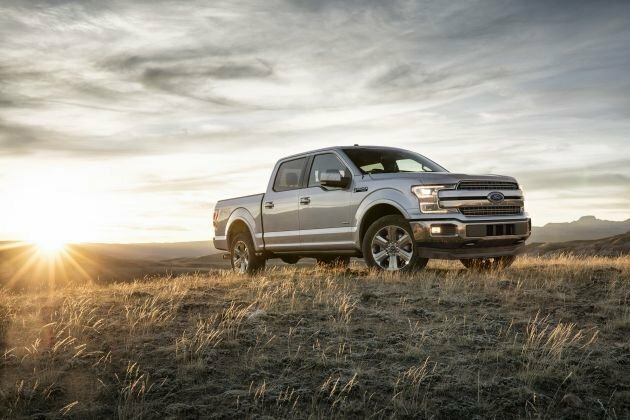 Ford had not released final 2018 F-150 specifications in time for this report, but a springtime reveal of the styling changes show revisions intended, the company said, “to convey strength, capability, boldness and power – without being ‘in-your-face’ aggressive.” The truck’s basic shape and size is unaltered, but it’s now available with seven fresh grille designs and six new wheel looks. The appearance changes bring the F-150 more in-line with Ford’s larger Super Duty F-250 three-quarter-ton and F-350 one-ton trucks and are accompanied by a host of updated safety and convenience features. Don’t expect much deviation from the 2017 model’s trim-level designations, body configurations, or bed lengths. At launch in the third quarter of 2017, the ’18 lineup is likely to begin again with the XL model and climb through XLT, Lariat, King Ranch, Platinum, and Limited grades. An updated version of the off-road-themed Raptor model will probably follow during 2018. Returning for the ’18 F-150 line will be the two-door Regular Cab, the extended-cab Super Cab with two reduced-scale rear doors, and the Super Crew with four full-size doors. Available bed lengths will include 5.5, 6.5, and 8 feet, depending on cab configuration. Four engines will again be available: three V-6s – the diesel among them — and one V-8. Sure, if you’re OK with the current styling, powertrains, and feature set. Price-conscious shopper should also consider a 2017, since Ford is likely to ramp-up ’17 F-150 incentives to clear showroom space for the revised 2018s. With three cab styles, three bed lengths, four engines, rear-wheel drive and four-wheel drive (4WD), myriad axle ratios, exterior and interior packages, wheel types, and accessories, you can configure an F-150 to be anything from workhorse to show horse. Just be prepared to dig deep into your checkbook if you want one with luxury touches. The 2017 F-150 introduced the segment’s first 10-speed automatic transmission. This gearbox is offered only with Ford’s optional EcoBoost 3.5-liter twin-turbocharged V-6, itself upgraded for ’17 to produce a massive 470 pound-feet of torque – a 50 pound-foot-increase over 2016 engine. It’s a very slick drivetrain and the most popular among F-150 buyers; you should have no trouble sourcing one if it suits your fancy. The ’17 F-150’s other engines use a 6-speed automatic, which also works well, but note that the more advanced 10-speed will be available on more models for 2018. Gone are days when big rigs like the F-150 were redesigned once a decade, with only minor updates in the intervening years. The pickup lifecycle is now more akin to that of the passenger car: six to eight years between design generations, with a major freshening around the halfway point. That’s the story with the current-generation F-150, which was introduced as a 2015 model and expects a full redesign for model-year 2020. All 2018 F-150s get a new grille, with minor appearance differences depending on model grade but united by a horizontal, twin-bar motif designed to accentuate the truck’s width. The new grille is flanked by updated versions of the outgoing model’s “c-clamp” shaped headlights with LED daytime running lights and available LED illumination. The profile view retains the drop-down in the front door windows, while the new-look wheels repeat in diameters ranging from 17-inches to 22 inches. Tailgates on XL, XLT, and Lariat trims replace the F-150 badge with the stamped-in “F-150” name. Details on the 2018 interior were not released in time for this report; don’t expect big changes, although look for introduction of 4G LTE connectivity to turn the truck into a rolling Wi-Fi hotspot. Also available will be a new high-end Bang & Olufsen PLAY audio system. Most models will offer the latest – and vastly improved — iteration of Ford’s Sync 3 infotainment system with support for Apple CarPlay and Google Android Auto. Cabin accommodations should again range from spartan in the XL to opulent in the Platinum and Limited. Rear-seat room is a little short on leg room in the extended cab but limousine-like in the Super Crew. The overall package should be plenty good to keep Ford die-hards happy and may win over converts from other brands. Yes, several, including a new base V-6 and an updated turbocharged V-6. Four engines will again be available: three V-6s and one V-8. The all-new V-6 is a naturally aspirated (meaning no turbo or supercharger) 3.3-liter. It replaces a naturally aspirated 3.5-liter V-6, with no change in output, at 282 horsepower and 253 pound-feet of torque. But it’s expected to be more fuel efficient than the 3.5-liter. It should be standard on the XL and XLT and pair with a 6-speed automatic transmission. Ford will update the F-150’s 2.7-liter turbocharged V-6. Output was unavailable in time for this review, but it will likely exceed the previous iteration’s 325 horsepower and 375 pound-feet of torque. Expect it to be standard on the Lariat and optional on the XL and XLT. Standard on the King Ranch and Platinum and optional on the XL, XLT, and Lariat will be a revised version of the outgoing models’ 5.0-liter V-8. As with the 2.7 V-6, Ford was mum on exact specs, but expect it to improve upon the previous 385 horsepower and 387 pound-feet of torque. For 2018, both the turbo 2.7 and the V-8 will pair with the 10-speed automatic transmission, an option for 2017 in place of the 6-speed auto. Standard on the Limited and optional on all other models will be the aforementioned 3.5-liter twin-turbocharged V-6 from the automaker’s EcoBoost engine family. Revised for 2017, this engine will again have 375 horsepower and 470 pound-feet of torque and pair with the 10-speed automatic. Specifications for F-150’s new diesel engine were not available in time for this review. We do know it will be a 3.0-liter turbo V-6 and will also use the 10-speed automatic. We’re guessing it will produce somewhere in the range of 250 horsepower and 450 pound-feet of torque. It’ll be only the second diesel ever offered in the half-ton-pickup segment – and could be the only one available for model-year 2018, pending outcome of an emissions-compliance snafu that’s caused Fiat Chrysler Automobiles to suspend sales of the turbodiesel V-6 available in the Ram 1500. That Fiat-sourced 3.0-liter engine had been rated 240 horsepower and 420 pound-feet. The 2018 F-150’s maximum payload capacities should again range from around 1,910-3,270 pounds, with towing capacities spanning 7,600-12,200 pounds. All models will come standard with rear-wheel drive. XL and XLT will offer optional part-time 4-wheel drive (4WD) that includes low-range gearing for off-road use but should not be left engaged on dry pavement. The available 4WD system on Lariat and higher models will also have a low gear and also come with a setting that allows the system to behave like a crossover’s on-demand all-wheel drive system, meaning you can leave this mode engaged at all times. Almost certainly, at least for three of the engines. The new base 3.3-liter V-6 should improve upon its 3.5-liter predecessor’s 2017 EPA fuel-economy ratings of 18/24/20 city/highway/combined with rear-wheel drive and 17/23/19 with 4WD. The revised 2.7-liter turbo V-6 should also do a bit better than the outgoing models’ ratings of 19/26/22 mpg with rear drive and 18/23/20 with 4WD. Same goes for the 5.0-liter V-8, which was rated 14/20/16 with rear drive and 15/21/17 with 4WD for 2017. Likely unchanged with be the ratings for the 3.5-liter turbo V-6. Its 2017 ratings were 18/25/21 with 2WD and 17/23/20 with 4WD. The available diesel will probably rate somewhere in the range of 20/28/23 mpg with rear drive and 19/27/22 with 4WD. The gasoline models should continue to use regular-grade 87-octane fuel, and we expect the 3.3 V-6 and 5.0 V-8 to be compatible with E85 ethanol-blended fuel. Further, all F-150s will come standard with an engine-idle stop/start function that turns off the motor when the truck is stationary and instantly restarts it when the driver releases their foot from the brake pedal. Yes. The 2018 Ford F-150 will be available with a number of new safety and convenience features. Among the new driver-assistance items will be full-speed adaptive cruise control that can maintain a set following distance from traffic ahead and even bring the truck to a complete stop. Also new will be autonomous emergency braking designed to mitigate a frontal collision with another vehicle or a pedestrian. F-150s equipped with autonomous braking and adaptive cruise will be eligible for the industry’s most coveted safety accolade, Top Safety Pick+ status from the Insurance Institute for Highway Safety. These new driver assists will join previously available safety features that include lane-maintaining automatic steering, blind-spot alert, and a surround-view camera. A complete roster of standard and optional equipment for the ’18 F-150 will be available closer to the truck’s launch. Figure on available luxuries to include leather upholstery, heated and ventilated front seats, heated rear seats, a heated steering wheel, in-dash GPS navigation, power-folding exterior mirrors, pushbutton engine start, driver-seat memory, and more. Most, if not all, of these items will be standard on the King Ranch, Platinum, and Limited, and optional on the Lariat. Count on them being higher, given the updated sheetmetal and drivetrains. Further, don’t expect exceptionally generous incentives when the ’18 model starts arriving in showrooms. Our base-price estimates here include the manufacturer destination fee, which was $1,295 on the 2017 F-150. Figure on the regular-cab, rear-drive F-150 XL with the 3.3-liter V-6 to start at around $29,000. At the top of the pecking order, a 4WD Limited with every conceivable option, including hands-free parallel parking assist, spray-in bedliner, high-capacity 36-gallon fuel tank, an access step built into the tailgate, and extra cost paint to check in at an eye-opening $70,000. Most F-150 buyers will pick something in the middle. With rear-wheel drive, an XLT should start at about $35,000; a Lariat extended cab at $43,000; a King Ranch Super Crew at $52,000; and a Platinum Super Crew at $55,000. Add an extra $3,000 or so for 4WD. The 2.7-liter turbo V-6 for the XL and XLT will probably cost about $1,000. The 5.0 V-8 will be about $800-$1,500 depending on trim level. The 3.5-liter turbo V-6 will run in the $1,200-$2,500 area. Expect the new diesel engine to pack a premium of at least $3,000. The sweet spot for the ’18 F-150 is probably a 4WD crew cab XLT with the 6.5-foot bed; 3.5-liter turbo V-6; an option package that would include heated power front seats, upgraded instrument cluster, storage bins under the rear seats, Sync 3, extra USB charging ports, and chrome exterior addenda; heavy-duty trailering package; and blind-spot alert, all of which would carry a sticker price of about $50,000. Lower that figure by about $3,000-$5,000 if you don’t need or want the extra towing capability and/or the high-output V-6. The 2018 Ford F-150 should start reaching dealerships in the fall of 2017. Ford looks like it is addressing our most pressing concerns with the outgoing F-150 by expanding availability of the 10-speed transmission and making additional driver-assistance features a part of the package. We’re curious to see how the new gearbox pairs with the other engines, as well as how the upcoming diesel will perform, assuming it passes scrutiny for emissions.